CSS Website Design was the primary focus on re-branding the Dave Bearson Construction website presence. Bearson Enterprises an Oregon company, offers innovative construction ideas for accessibility remodeling. Thirty-six years experience in the local area with professional ethical advice. Offering reliable service to all of their clients. Bearson Enterprises prides itself on offering a variety of accessible modifications for new or existing structures. Making the life of the physically challenged more comfortable. By offering lifts, elevators, and other products produced by world class manufacturers. Such as Thyssenkrupp/Access, National Wheel-O-Vator, and Bruno. Bearson Enterprises is able to offer you the best in both services and products. Bearson Enterprises is also a member of the Home Builders Association of Metropolitan Portland. In addition to their long history of business in the Pacific NW since 1972. Offerings include the personal guarantee of our President and Founder, David L. Bearson. A true Portland entrepreneur at heart. Whether it be designing and building a new structure or remodeling an existing one. Our goal is to improve the life of the physically challenged by helping to turn seemingly impossible feats into effortless tasks. CSS Website Design helped us make an accessible website for Bearson. The Dave Bearson team came to me and wanted to update their feel and look to the brand they have. Creating a modern logo that reflected their mission with accessibility. Cirv added over two hundred pages to the Dave Bearson Construction website to show there strong product offerings for providing accessibility. Developing a strategy to get them in front of their audience utilizing many channels. Utilizing an accessible website was a must as their core business is helping people improve their lifestyle. The user interface was designed to show heavy contrast with modern photos using CSS Website design. 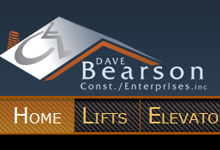 Dave Bearson sells many different kinds of elevators and lifts and wanted to reflect the many options they had available to them for their current customer base. After all the customer should not be the ones that have to search high and low for the exact fit they need to adapt to their home. So we developed a virtual catalogue to show all of the variations available to potential customers in one website environment. Full with PDF datasheets and tons of pictures of what the customer is buying. After all once installed it is hard to take it back. Cirv based the website on current web standards via 2011 including CSS website design standards.